Enjoy an exciting Jet Ski ride along Biscayne Bay and expereince the coastal splendor of Miami Beach. Select your 1-hour rental time and get ready to hit the waters on your 160-horsepower Yamaha Jet. No experience is needed and deposits are not required. The goal is simply to have a good time. Arrive at the rental office located @ 401 Biscayne Blvd, Miami, Fl. 33132. Once here, you may need to a take a temporary boater's test before embarking on your ride. 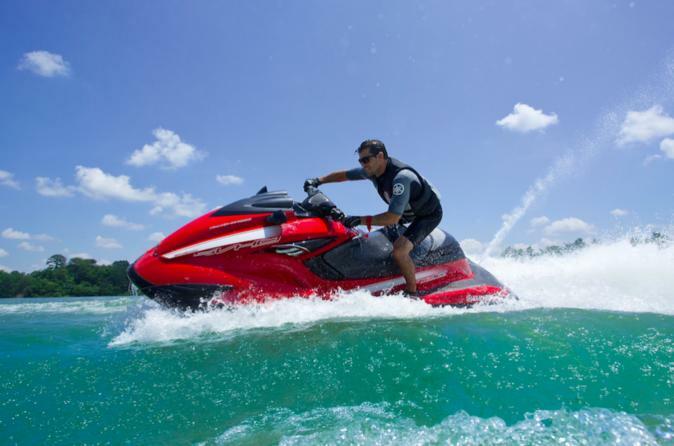 Following a brief safety training and instruction, don a life jacket and set out aboard your 2019 1.8 liter, 160 horsepower Yamaha jet ski (each jet ski can accommodate 2 people or or 450 lbs (204.5 kg) comfortably) for a ride across the area's largest open jet ski stretch ― one in which there's very little boat traffic. Enjoy fantastic views of the Miami skyline as you soar upon the water, admiring the massive celebrity homes and catching sight of local wildlife such as manatees and flying fish.